We are delighted to host a talk on creative thinking by expert Rod Judkins. 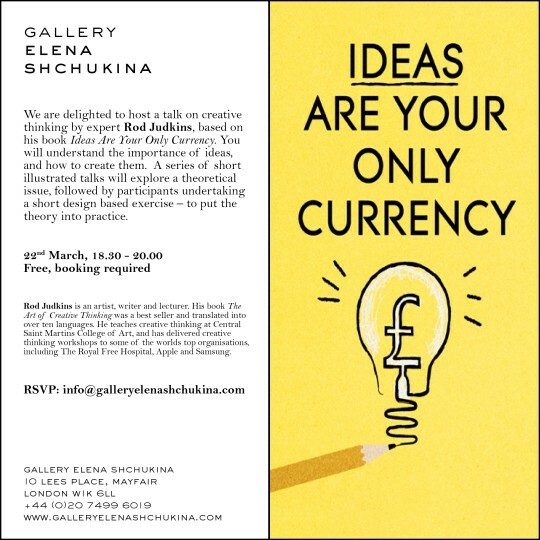 Based on his book Ideas Are Your Only Currency, the theme of the talk is to understand the importance of ideas and how to create them. The real currency of our time isn’t money. It’s ideas. You’re surrounded by ideas. Films, products, books, music, messages, services and everything in your culture began life as a vision in someone’s head. If you have ideas, you’re at the heart of things. A series of short illustrated talks will explore a theoretical issue, followed by participants undertaking a short design based exercise – to put the theory into practice.